Size doesn’t matter. It’s quality over quantity. These are the things you tell yourself, but sometimes you have to face the fact that what you have just isn’t big enough, especially if you have a bunch of friends round and they all want to be able to see. Thankfully the nice people in BenQ sent us their W1090 projector to play around with for a little while, so we can turn any large flat surface into a screen. Nice! The unit itself is pretty large, but when you factor in the light output, the size of the lens and the cooling system, space is well used. It’s a decent looking device too, I like that BenQ didn’t just go for the “black box” approach, opting instead for a matte white finish. Basically, it’s not something you would object to having visible in your house. The controls are readily accessible and well laid out but are not obtrusive and the W1090 can be fully controlled from the unit itself or the rather clean and simply styled remote. This is really handy if you want to make a hidden or fitted installation of the device or plan to mount it to the ceiling. It’s backlit too, so no fumbling around in the dark when using it. Setup is an absolute doddle. There are plenty of input ports on the back of the unit including 2 HDMI ports. Plug in your source using an HDMI cable etc hit the power button and voila – you have a picture. Zooming and focusing are super easy thanks to the large controls on the unit and simple up and down buttons enable you to change the shape of the image to match the surface it’s being shown on and make it nice and square. You will spend more time faffing about with the 3 adjustable feet and position of the projector, perfecting the angle and ensuring that the image is exactly where you want it to be than you will with the actual setup. The feet screw in and out allowing you to angle and stabilise the unit, and although I would have preferred a bit more extension in them, you can always prop them up easily. Good job BenQ! One of the main issues with projectors has always been the level of light they can produce. If you have an underpowered projector, your image will appear washed out and fuzzy, especially if you aren’t watching in complete darkness. I set the W1090 up in my loft man cave in the middle of the afternoon on a pretty bright day. I hung a cloth in front of the Velux window to cut out some of the light, and even though the room was far from dark, I was very pleasantly surprised at the results. Projected on the sloped ceiling, the W1090 produced an impressively strong, solid image. It does boast that it is capable of showing full 1080 HD as well as 3D (1 set of glasses are supplied with the unit), but to be honest, I wasn’t expecting it to look as good as a TV. Again, watching movies from the basic, bog-standard Blu-ray player I had plugged into it, I was pleasantly surprised at the sharp and well-contrasted image the BenQ was able to create. It’s not too noisy either, despite having two decent sized cooling fans in it. Although be warned, it does blow out quite a bit of warm air! I would have loved to have created a back garden cinema to really see what the W1090 was capable off, but unfortunately, we had limited time with the projector and so were unable to fully explore the full extent of the device. The only downside I would level at the W1090 is the in-built audio. It’s not terrible by any means, but the sound from the 10w speakers is a bit weedy. The thing is though, no one is actually going to be using them, so it’s a bit of a moot point. The projector will likely be set up above or behind you and you definitely won’t want the sound coming from there. Even if it’s positioned between you and the image, if you are going to the cost and effort of having a setup that enables you to watch a movie on a 12-foot screen, you are going to want audio to match. One thing to note if you are having it positioned in front of you, I did notice that light does leak from the sides of the unit slightly. No big deal, but there are people who will get distracted/annoyed by this. The audio out option on the BenQ is a 3.5mm jack. I would have liked to have seen a few more options for connecting to external audio devices, especially given that the projector and speakers are likely to be a good distance apart. At around the £600-650 range, it’s certainly not cheap, but when you put it into context and set it against its peers, it’s actually quite reasonably priced and you do get a lot of bang for your buck. Yes, you will have to change the bulb after a couple of thousand hours of use, but this is for movies, cup finals etc, not for watching Corrie on, so it’s going to take some time to wear out. 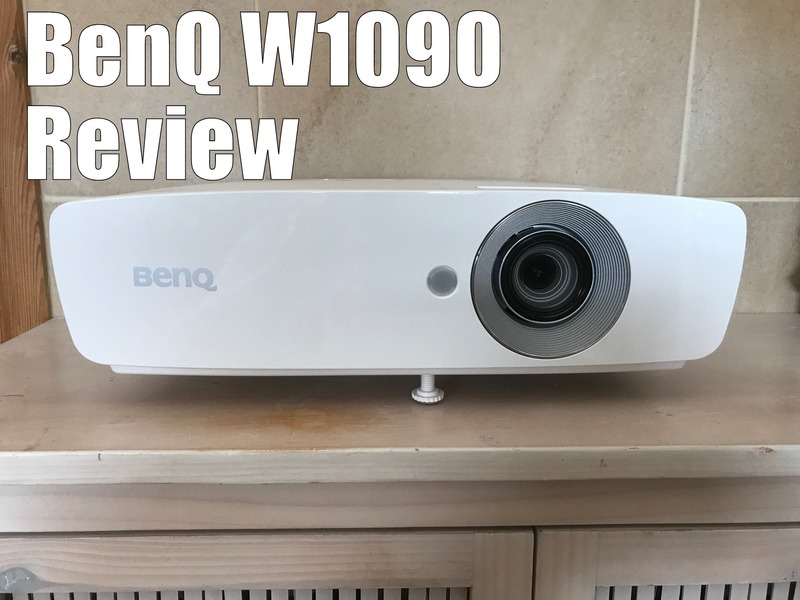 If you are in the market for a good quality projector and don’t want to spend a fortune on one of the high-end models, the BenQ W1090 is definitely worth your consideration. You can pick one up from Amazon here for around £555.